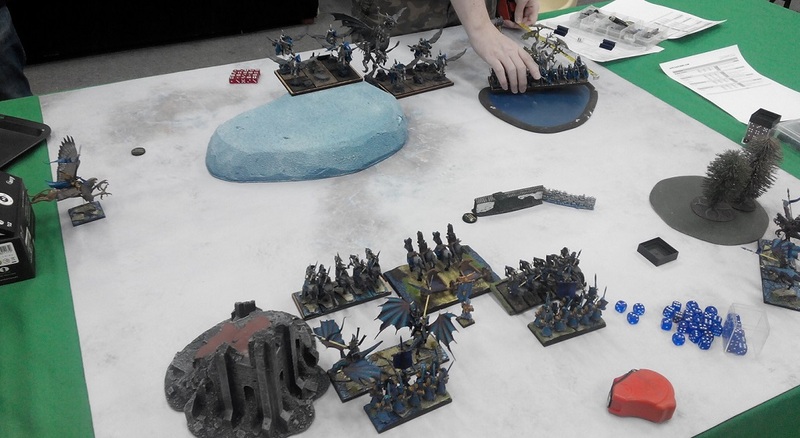 In the first game of the tournament I played against Mark and his Elves. I played against Mark several times already and he brought his favorite units with a smaller force too. His army was more compact, very fast and more durable than mine. 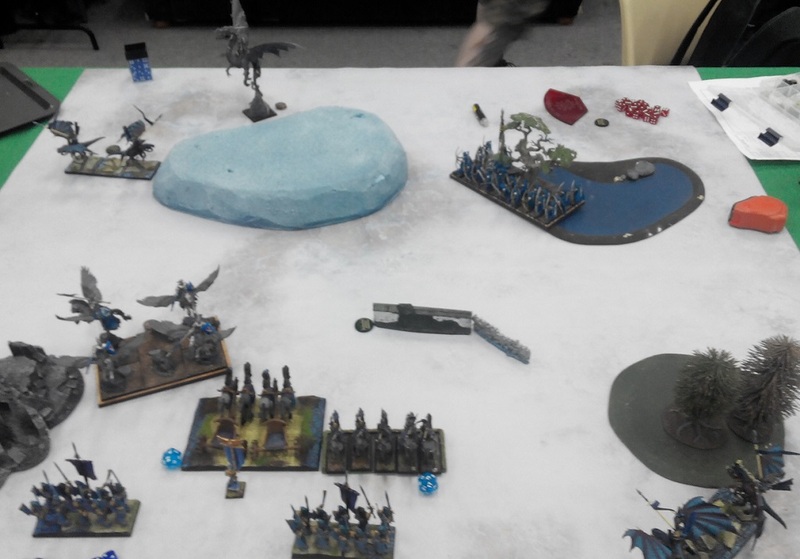 It is always very interesting to play against Mark because he has a different approach to the Elven forces. Hence, it creates an unique match up where opponents have good understanding of each other armies but due to different compositions it still feels as if two completely different forces were fighting. Horde of Archers with Heart-seeking Chant is a powerful long range threat. 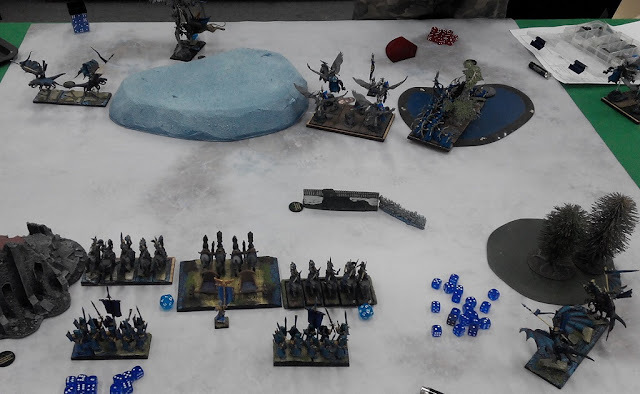 Backed up by Army Standard with Bane Chant it can do significant amount of damage to any target and has a very good chance to delete one unit of my force per turn. 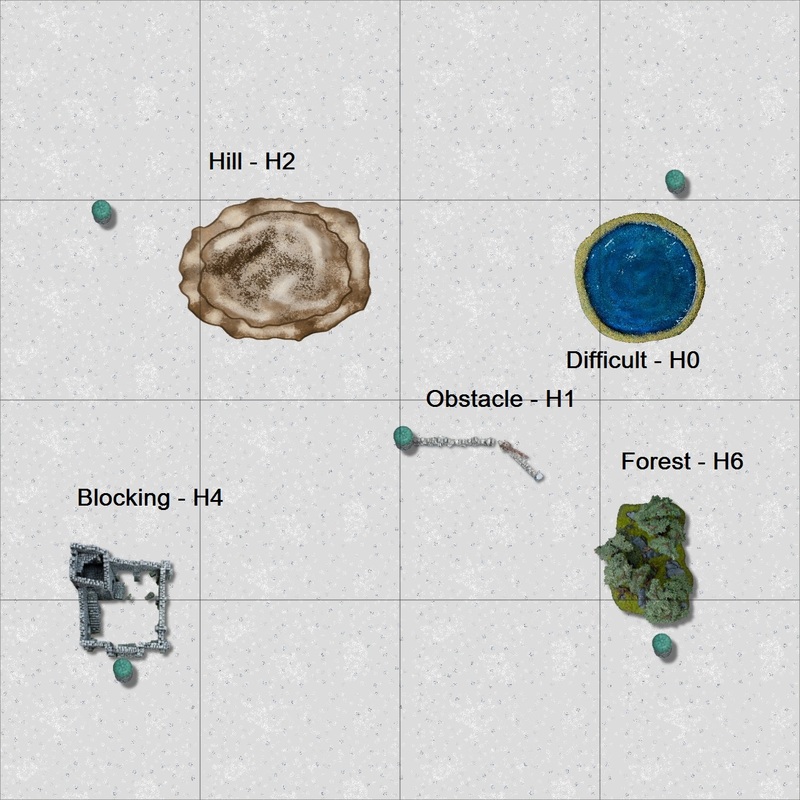 That means I would need to use terrain as best as possible as avoiding the Archers on smaller table would not be possible. On the other hand two hordes of Drakons made a very strong attacking force on their own. But addition of the Dragon Kindred Lord would make them unstoppable. 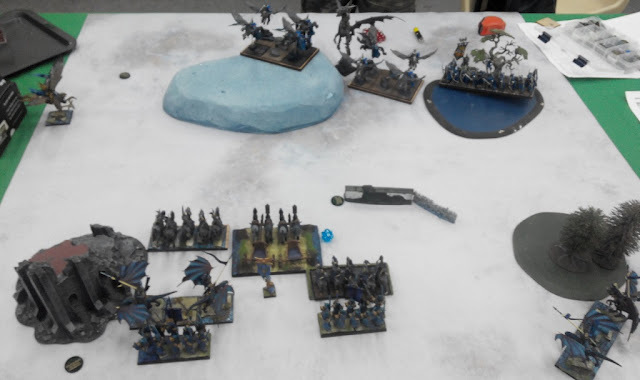 I simply had to assume there would be casualties so I was looking for a chance to win in the scenario as that would allow me to shift the potential imbalance in the lost units. 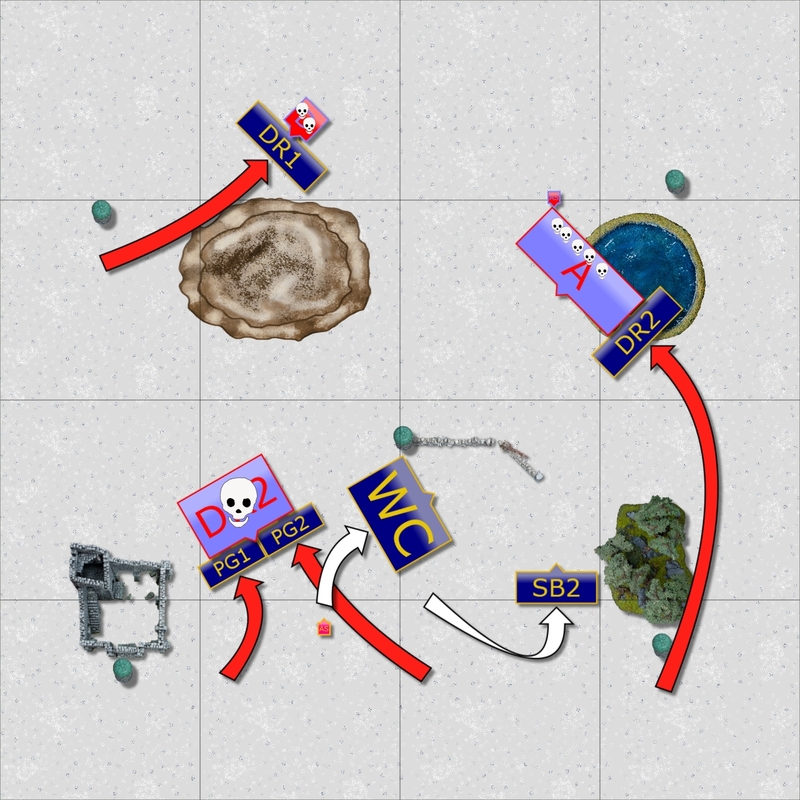 The scenario in that game was Pillage and we positioned 5 tokens. I won the roll and got 3 tokens to place. As usual, I positioned two in the corners and when Mark did something similar I put the last one in the middle. 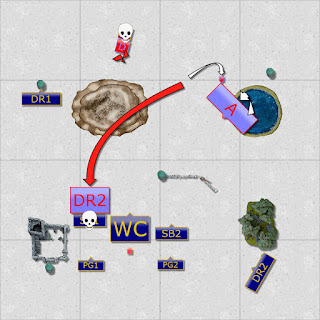 It was due to the fact I wanted to force his forces to move forward as otherwise his tougher units can also soak up the ranged damage I could inflict and play defensively. While forcing the army to move forward would potentially open some opportunities for multiple charges. At the same time I positioned the units mainly on the left to avoid first turn shooting (or at least add some movement/cover penalties). 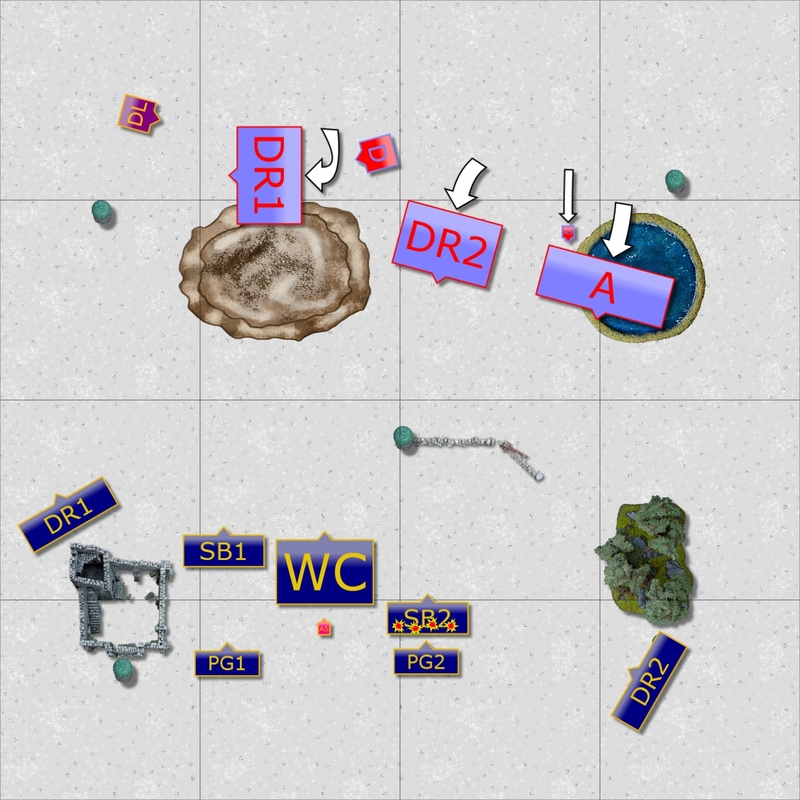 My plan was to try and hold to two tokens in my half while moving on the flank to threaten the enemy forces and contest 1-2 others to win on the scenario. I also intended to focus my shooting on a single unit for as long as it takes to destroy it. Especially that I could assume enemy Archers would start targeting my own shooters. 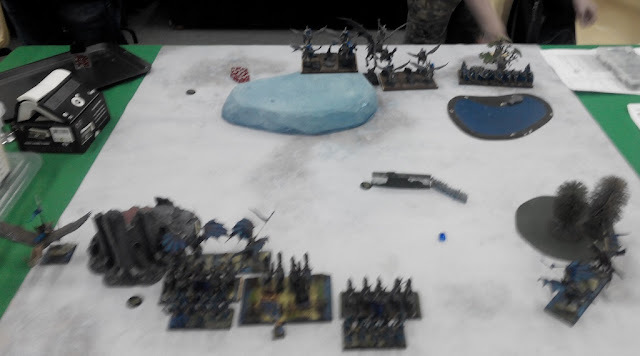 I won the roll off and took the first turn to start inflicting damage on the drakon riders. Another chapter in the civil war. 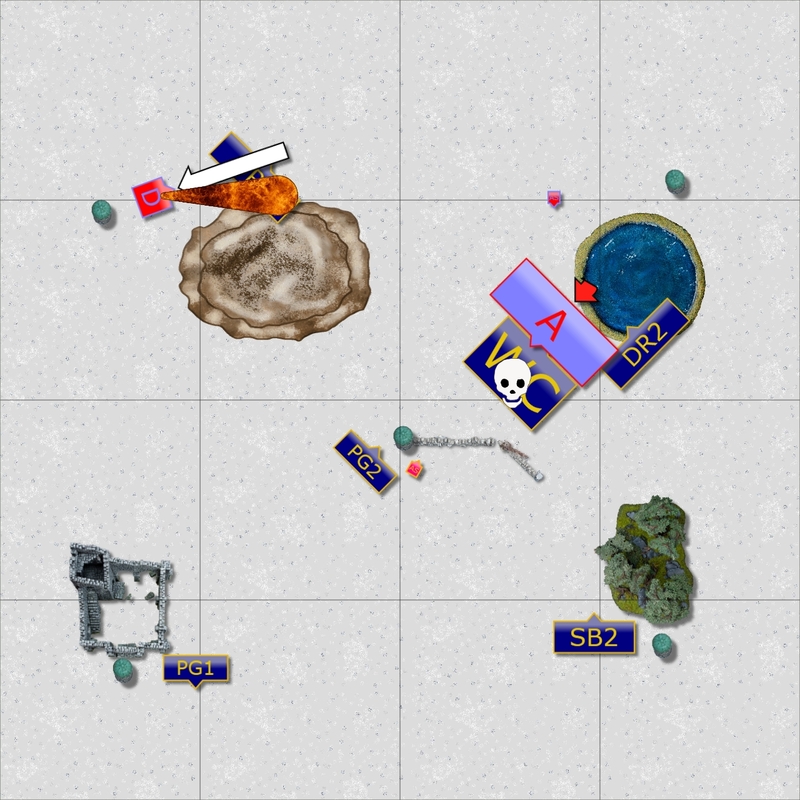 The Outcasts approached the enemy only to get into range for the shooters but being careful not to invite any charges from their powerful kindred. The shooting was quite successful but it was not enough to impress the enemy. 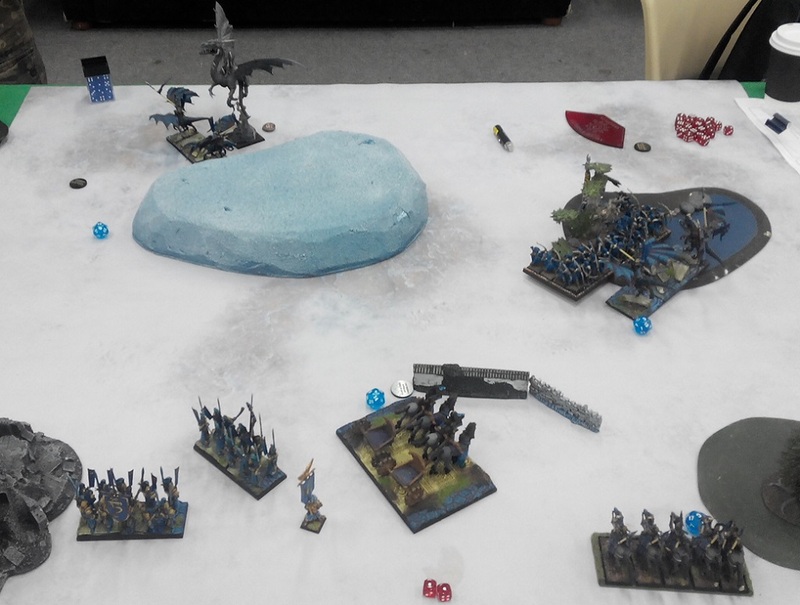 At the same time Drakon Lord moved swiftly along the flank and threatened the foe. Hopefully it would make the life of the enemy harder as they would need to choose between advancing and risking some flank charge or stall the advance to face new danger. Elves responded by rearranging the battle line and getting their own Archers into firing position. However, despite the magical support, the damage was not as big as expected and enemy chariots were still intact. The Outcasts continued shooting and outflanking the enemy. The target was still intact but obviously getting nervous. Especially that the Drakon Lord was still forcing them to hold the formation and stay put instead of flying forward. 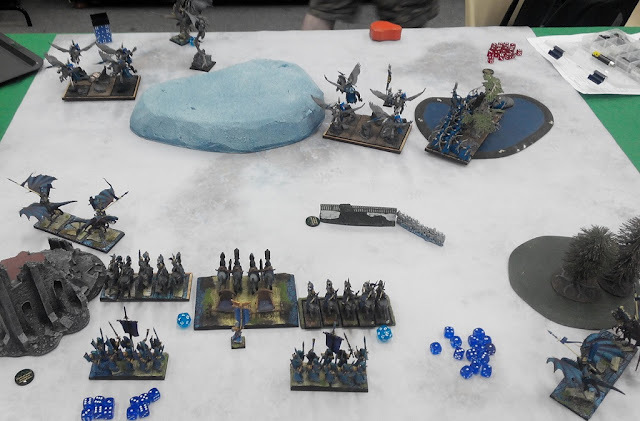 Elves decided to divide their formation and send half an army to chase the Drakon Lord and the other half to threaten the center of the enemy battle line. This time it was Silver Breeze cavalry that was the target for the Archers but they did not suffer that much damage either. The Outcasts continued maneuvering around the enemy forces and shooting at the same unit. Unfortunately, while moving around the flank seemed to work and distract the foe, then shooting was still not enough to destroy enemy flying cavalry. The Drakon Riders reformed again, this time to charge. 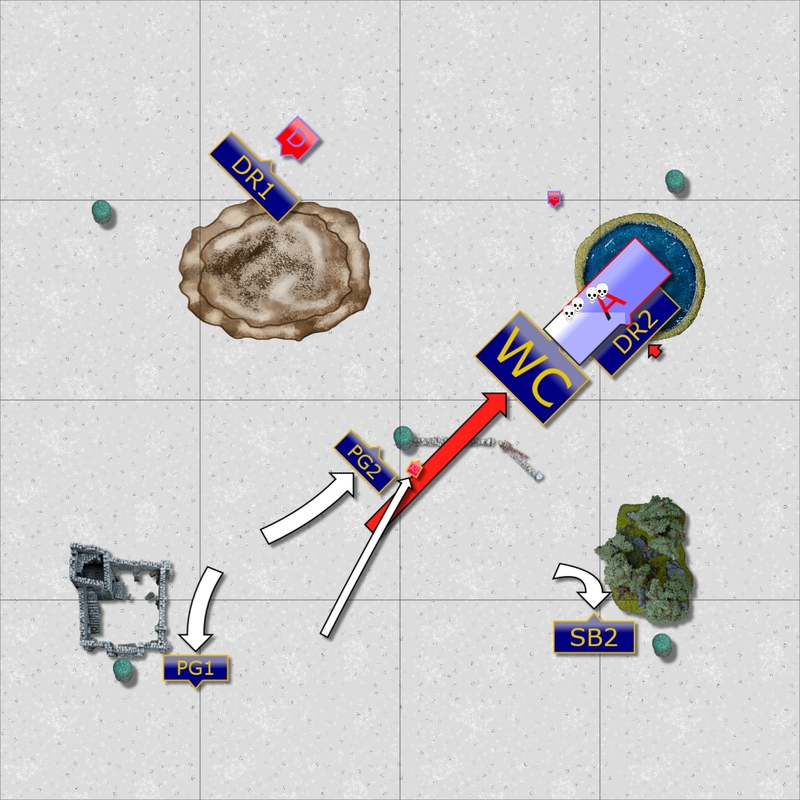 At the same time, the Archers and the Dragon Lord reformed to shoot at the enemy commander who foolishly flew on his own far behind the enemy lines. However, the Archers horribly miscalculated and were out of range! That saved the life of the foolhardy Drakon Lord! After all this maneuvering it was time to attack. 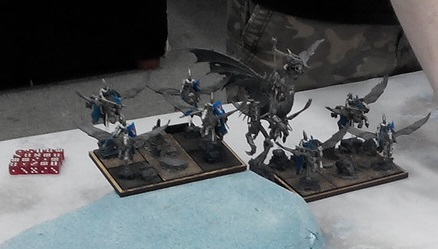 Drakon Riders on the left charged their damaged counterparts and routed them! The Drakon Lord also attacked the exposed flank of the enemy general on the dragon and while the beast was wounded it merely distracted it. But that was all the Outcasts needed now as they could focus their attention on a second unit of enemy flying cavalry. This time Drakon Riders did not wait any longer and chose to charge Silver Breeze cavalry who was no match fir such a ferocious attack. Also Drakon Lord could not hold against the fury of the Dragon once he attracted its full attention. 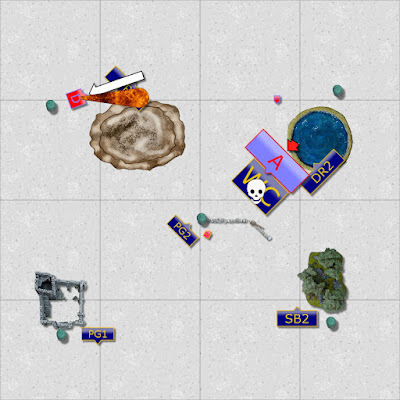 The Outcasts seized the initiative again and despite their losses, a lot of units attacked at once. Drakon Riders on the left challenged the Dragon to keep it busy for as long as possible. The second unit of the flying cavalry spotted the opening and attacked the Archers, mainly to prevent them from shooting. 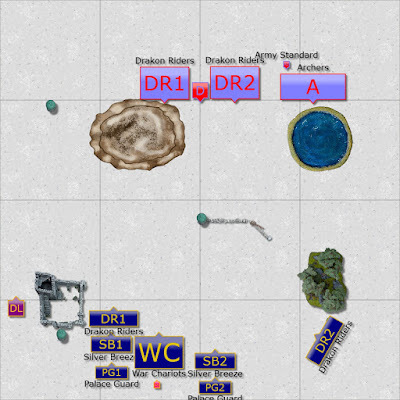 Finally, the Chariots moved out of the way so that the second wave of Palace Guard troops could intercept the enemy drakon riders and rout them too! With only two units left Elves had some limited opportunities to attack and simply continued fighting against Drakon Riders. 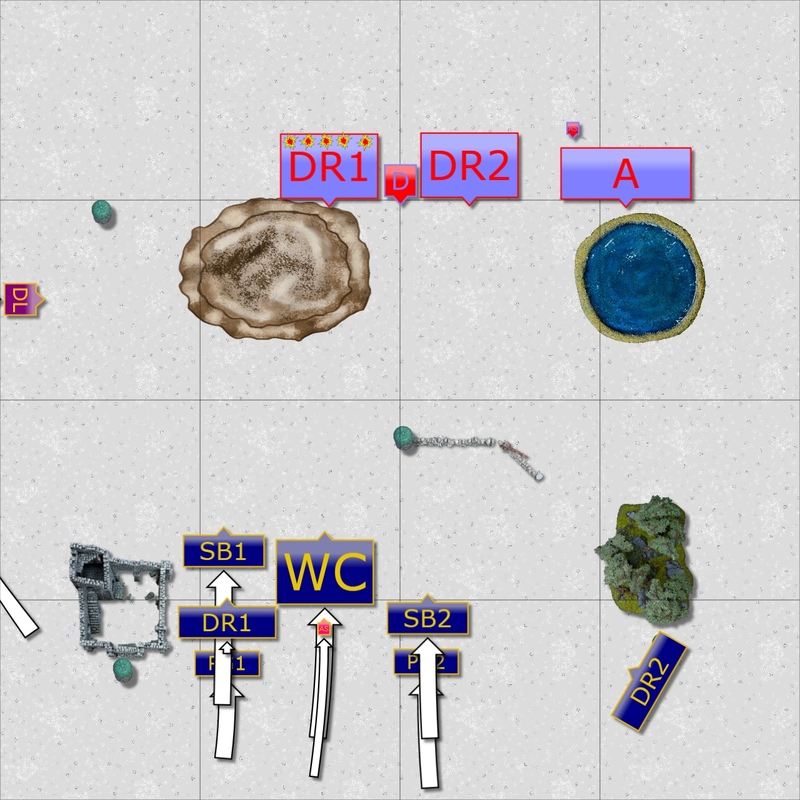 The Dragon managed to waver the ones it was fighting against while the Archers inflicted some more damage only to pin down the enemy. Both units of the Palace Guard and remaining Silver Breeze moved to secure the objectives while Chariots and Drakon Riders joined forces to attack the Archers. Unfortunately, the damage was not yet enough to rout them and the regiments were locked in melee. The Dragon was now free and it flew over the Drakon Riders to breath fire at them. That was too much for the brave riders and they withdraw knowing they did their job. While the Dragon was victorious it was too late for it to change the result of the battle. The Archers also claimed the enemy unit but where now vulnerable to a potential flank attack. 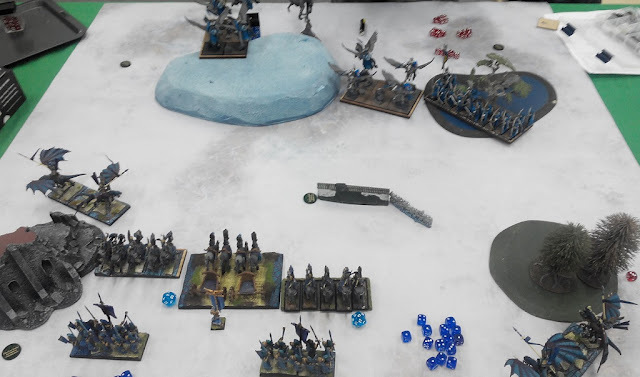 Fortunately, civilized Elves came to terms and both commanders decided it is time to withdraw as it was clear that the Outcasts secured the objectives. Turn by turn animation summary. Many thanks to Mark for a great game! It was refreshingly fast one and we finished it with time to spare. 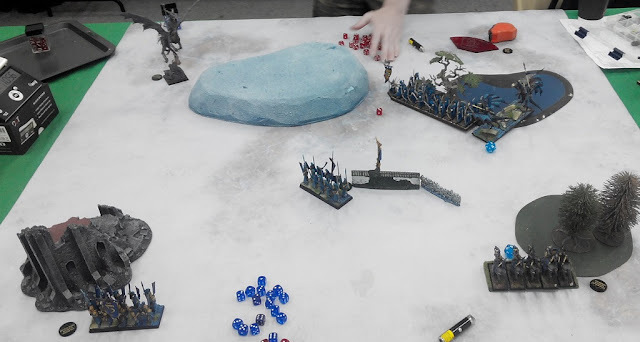 It was a very interesting match up for sure and I am glad I put up some decent fight as Mark went on to smashing all his opponents in the remaining games. Well done, Mark! I was very happy that the plan worked. My advantage was the larger number of units that could potentially claim the objectives. While for Mark any unit routed meant harder time to fulfill the scenario goals. 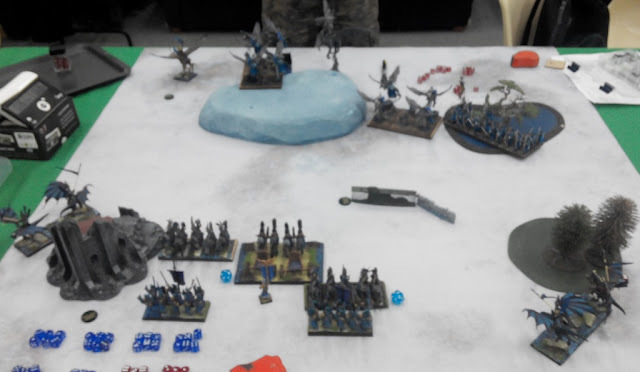 I believe he had a dilemma as if he attacked aggressively he may have invite some flank charges while staying in formation as he did allowed me to inflict some damage with shooting. Still, it took me 3 turns and I could not rout the Drakon Riders! It is good then I had some units in position to charge. 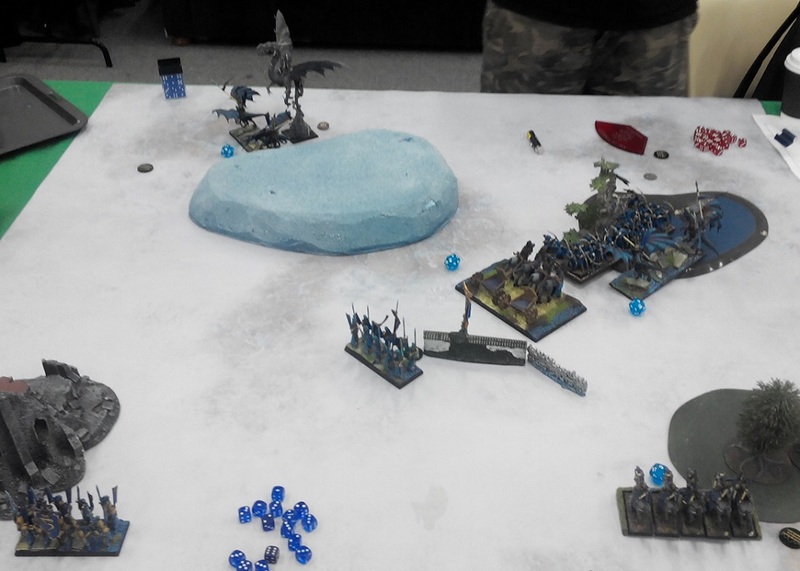 The crucial point of the game was when Mark miscalculated with his Archers and was out of range for shooting at my Drakon Lord. It definitely made my life easier as Mark lost one turn of shooting and I could pin down the Dragon for long enough to prevent it from joining the fight in the center. In the end we had only 80 points difference in Mark's favor so the victory was based on the scenario conditions alone. It means that I would get the same amount of points in BlackJack and CoK scoring systems. During the game I focused on the scenario and did not really changed my tactics due to BlackJack. 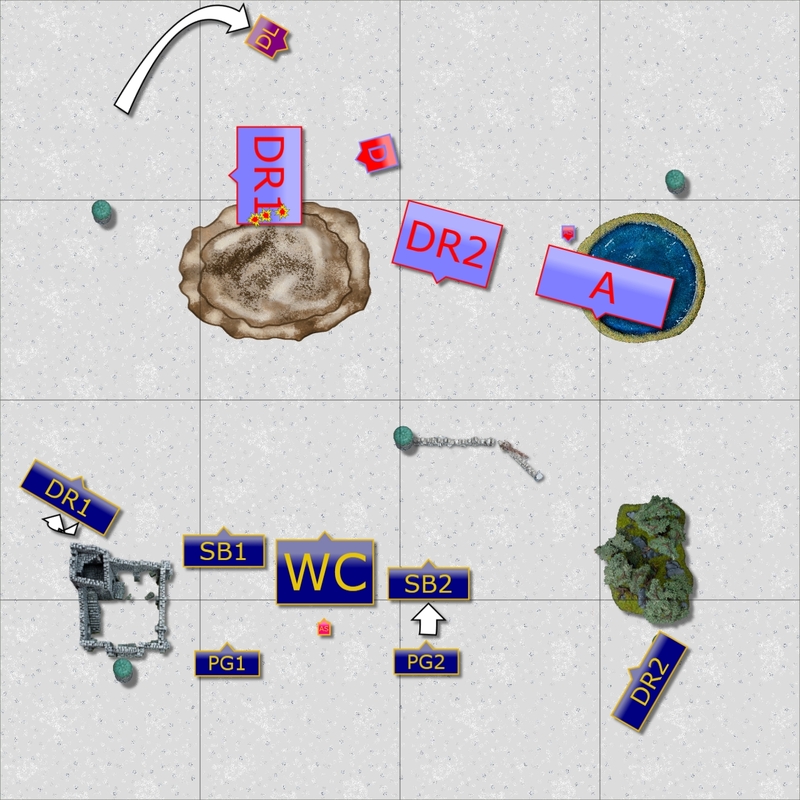 I simply had to make sure I control three objectives on my half of the table and attempted to control or contest on the top left in case some of my units are routed due to shooting. I was thus considering any potential extra points for objectives only as a bonus if the opportunity presented itself. I also knew I cannot claim the objectives without routing some of the enemy units and hence careful positioning and maneuvering for the first half of the battle. I could continue the ranged attacks exchange because the Archers were not that efficient this time and as long as that happened I had more units to control objectives. I hope you enjoyed the first report. It’s been a while. Life had been getting in the way of my hobby for the past few months, and I’m slowly getting back into it. This is a very good time to get back in with vanguard coming as well as some new models from mantic. It’s great to see you keeping on with the reports; they are as wonderful as always. You had a perfect game plan for this one and it just so happened to work out perfectly (which we both know doesn’t always happen :)). I’ll be popping in more often to check in on your adventures. Welcome back! Great to know you will be doing some hobby again. Tell me about real life and its constant interference. 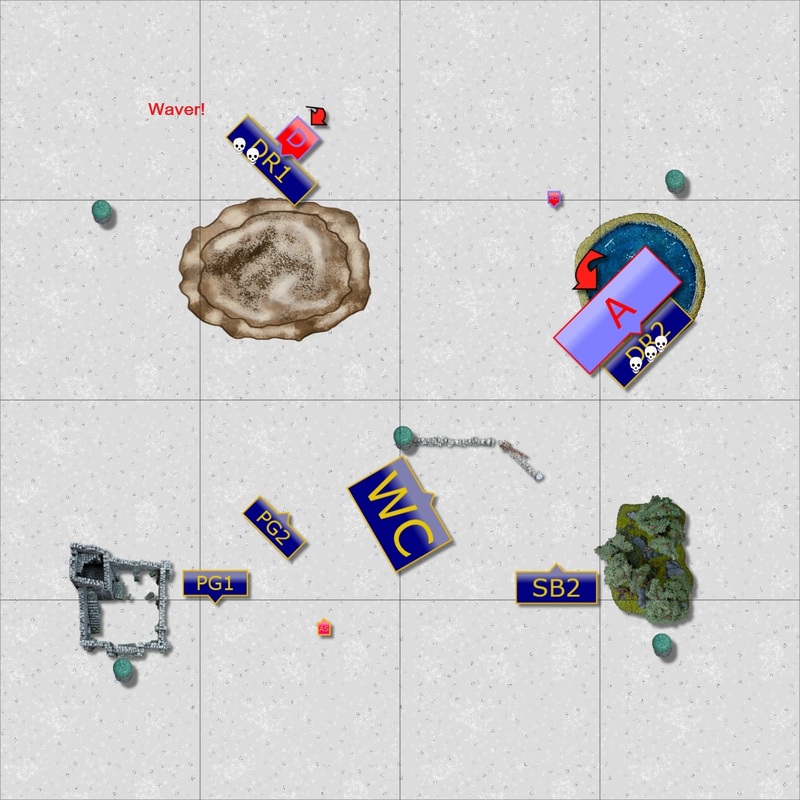 I am glad my plan worked, especially that I haven't had a chance to play at 1200 points and 4' x 4' table before. I must add I greatly enjoyed these games and I am convinced it can be a great entry level for new players too. Of course with all the hype due to the Vanguard game it is even more interesting as I really like the idea of linking both games for some cool special scenarios etc. I am looking forward to seeing the details of the new game! Congrats on the win! You had a battle plan and seemed to carry it out flawlessly. Looking forward to the other reports. Thanks! 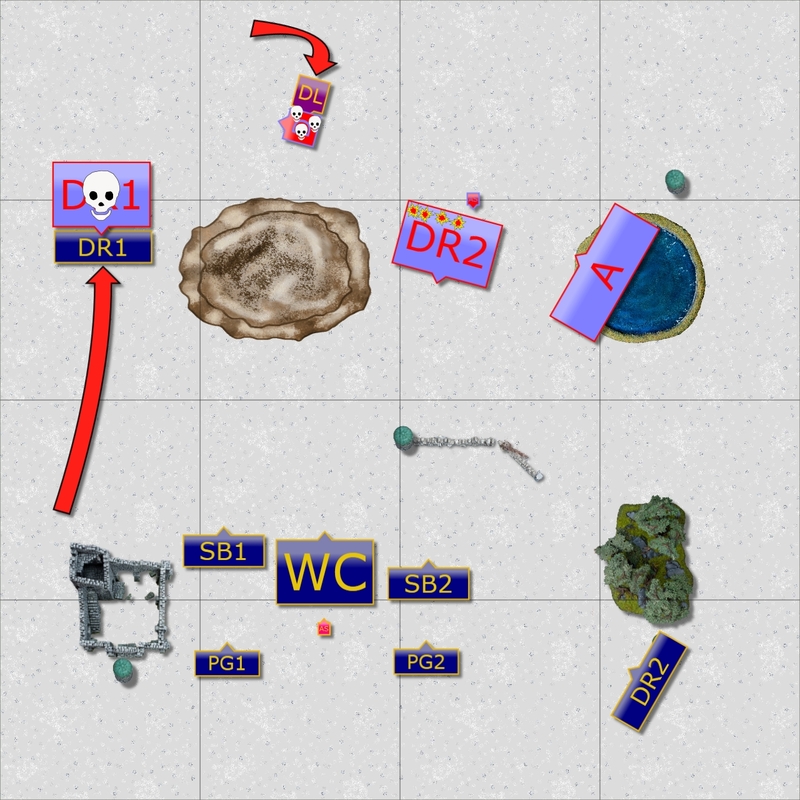 It does feel good when things work the way you hoped they would :) I have just started working on the maps for the game 2 so I think I should be able to upload the new report during the weekend at the latest. Great report! 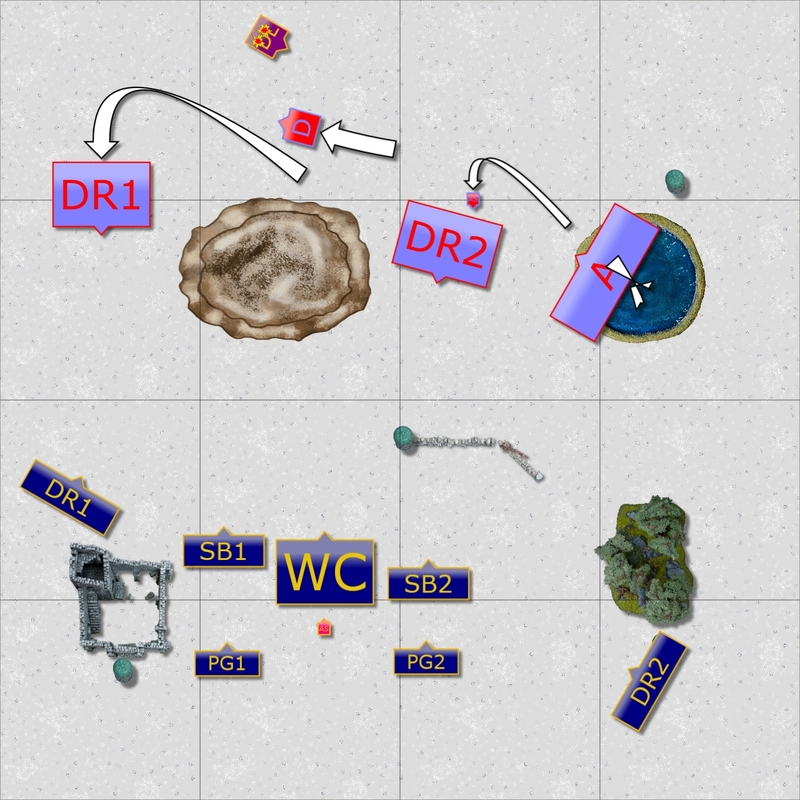 it's always interesting to see a battle where a good portion of the game revolves around manouevring*. Thank you! I am glad you like it, I enjoy that element of the game a lot. It is always something I try to achieve in my games and the army I use favors this approach.